Whether their dream is to be free of the job, spend more time with their family, or have complete financial freedom, this book lets your distributors and their prospects know about how great network marketing is as a vehicle to make their dreams come true. Totally generic in approach, no company names, titles, products, services, organizations or residential locations are given. This book is about people from all walks of life, who used network marketing to succeed. This fascinating book was published solely to get distributors and prospects fired up about the business. It supports the entire industry and the idea that anyone can use it as a vehicle of success! No matter who they are or what their dreams may be, all of your distributors need someone on the sidelines encouraging them, giving advice and helping them stay motivated. Filled with 50 inspiring stories from leaders across the industry, it gives your people the hope they need to keep going to make their dreams come true. 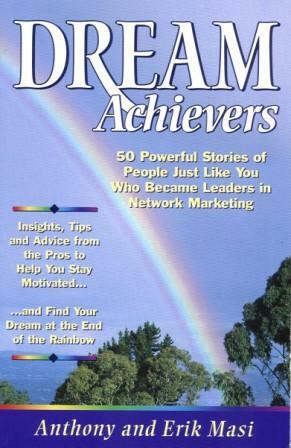 The dream achievers featured in this book share their personal stories of overcoming, while revealing their secrets of success. From rags to riches, from discouragement to hope, from failure to triumph, from incredible circumstances to victory, these 50 top producers provide your people with a lifetime of priceless knowledge and encouragement. Read this book and apply what you've learned. Then, one day soon, you, too, could proclaim..."I am a dream achiever!"